Oilmen’s offers four styles of fuel trucks. These refined fuel tank trucks have the ability to haul anywhere from 500 to 6,000 gallons of diesel fuel or gasoline. 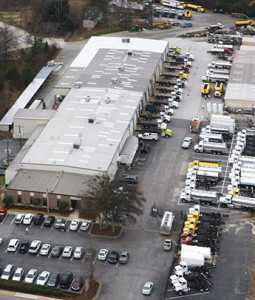 View our current inventory of trucks for sale or see our recently delivered fuel trucks. This is our most popular selling tank truck model for hauling fuel. This tanker is also one of the most versatile fuel trucks we build. It has a fully enclosed rear equipment compartment that keeps the hose, reel, and meter protected from the elements. The raise-up rear door provides shelter to the operator from the weather. This style tank allows ample room for piping and equipment, increasing storage space for buckets or oil wipes. Aluminum side doors on either side of the compartment improve access to the equipment for easier maintenance and create storage space. This model is a favorite of oil and fuel jobbers throughout the United States. This style truck tank accommodates multiple inverted hose reels in a large rear equipment canopy. The meter box is located directly under the canopy and is accessed by two aluminum fold-down doors. The AL5D is a popular model among fuel jobbers that specialize in fleet refueling. The “Bikini” style tank truck is similar to the AL5D except the rear head does not extend all the way to the bottom of the tank profile. Like the AL5D, the hose reels are inverted in the canopy and the meter is located in a box below. This style is very popular as a heating oil truck tank in the Northeast US. The “Transport” style bobtail truck has the hose reels and meters housed in one or both side cabinets. Fuel can be stored in compartments that run from the back of the cab all the way to the bumper. The transport style truck tank is very popular among oil companies in the Western US. 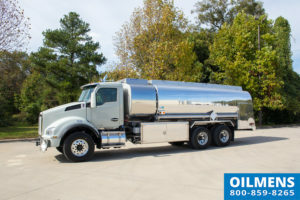 No matter what your style preference may be, Oilmen’s offers fuel trucks to keep your rolling stock looking good and operating efficiently. View our current inventory of fuel trucks for sale.